When seeking a stylish home-heating centrepiece, generations of homeowners have wrestled with the &#39form-versus-function dilemma'. Too often, available options have offered good looks or good performance u2013 but rarely both. Thankfully, contemporary designs of hole-in-the-wall glass gas fires have consigned this problem to history, and no one has done more to bring this about than the Stovax Group, manufacturers of the 530 Designio2 Glass Gas Fire. Based in the cathedral city of Exeter, Stovax Ltd began trading in 1981 as West Country wood-burning stove specialists, developing their first gas-fired products in 1988. Gazco Ltd, their sister company, was formed as a consequence of this development, thus assuming responsibility for a growing gas-fired range. Close collaboration and ongoing product development have since established these companies at the forefront of UK, European and global heating markets. Still in private hands and now the UK's premier stove and fireplace manufacturer, the Stovax Group focus on high-quality product design and customer service which is second to none. Their Riva2 530 Designio2 is a stunning example of a contemporary reworking of the gas-fire concept. With its clean lines, fine detailing and elegant reflective black-glass surfaces, the Designio2 appeals at first glance. Its uncluttered design oozes sophistication whilst its thoroughbred good looks create a natural focal point. Though the Designio2 concept does not feature a traditional &#39fireplace', nevertheless all eyes are still drawn towards the sheer beauty of its flickering flames. Here advanced technology, using a ceramic log fuel bed, captures the essence of burning logs and lifelike smouldering embers to deliver a highly realistic visual experience. Scoring heavily on aesthetic appeal, the Designio2 is also a revelation in economic terms. Whereas the heat efficiency of an older open-fronted gas fire may well be no more than 25 per cent, typically burning up to 9.45 kW of energy en route to outputting just 2.4 kW of room heat, the state-of-the-art Designio2 530 Glass Gas Fire delivers an amazing 75 per cent heating efficiency with a traditional chimney. When used with a balanced flue, however, heating efficiency rises still further to 82 per cent. The Designio2 is available with a choice of three heat-retaining linings: vermiculite, black reeded or brick effect. These linings offer enhanced heating efficiency by storing heat when the fire is in operation. This captured heat is then released to radiate around the room, boosting fuel economy even after the fire has been switched off. As befits a pedigree appliance, the Designio2 is operated via a sequential infra-red remote control which activates and handles all of its functions and includes comprehensive programmable timer and thermostat-control features. 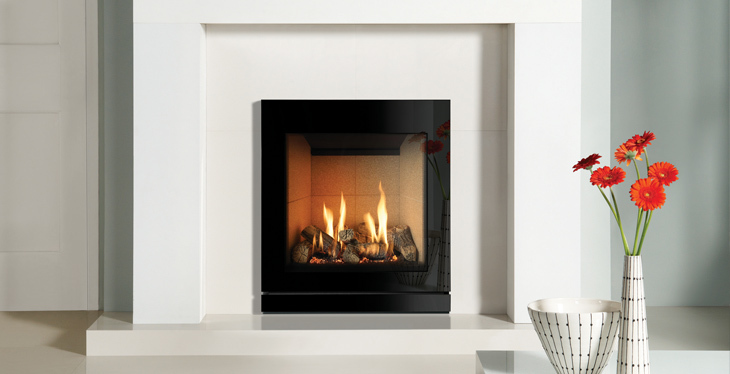 No chimney facility is required where the Designio2 is equipped with a balanced flue. In this mode, a double-insulated pipe vents to the directly to an exterior wall, thus the fire remains entirely sealed off from the room environment. With this arrangement, air is drawn in and combustion gases are removed without causing draughts u2013 leaving the homeowner to enjoy the full benefits of superb 21st-century heating technology.